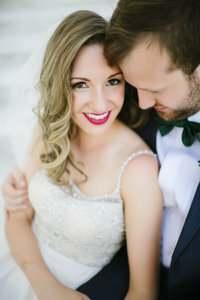 Katherine & Will were married this past May at Cherry Creek Golf Club in Shelby Township, Michigan. Upon arriving Katherine, her bridesmaids and family surrounded her with nothing but love and excitement! As each family member arrived the whole room filled with joy. I especially enjoyed the moment where her grandparents came to the bridal suite even to rest for a bit, it was very sweet to see their presence for Katherine. After, Katherine her family and bridesmaids finished getting their makeup on Katherine got dressed with just her mom so that they could have that moment together. Once she finished she had her dad come into the room to do a reveal, and it was so special. Having that time with her mom and Dad is something I don’t think any of them will ever forget. Katherine had some last minute touches and then had a gift for her parents. You guys, it was so sweet. Tears of joy, happiness and nothing but smiles. After the gifts it was time to head to the ceremony, I knew Katherine had a form of transportation but was so incredibly pleasantly surprised to see Motorcity Vintage Rentals there! They had a beautiful 1949 PACKARD “HUGO”. Katherine road gracefully with her father by her side to the ceremony location. We arrived to the church for the ceremony with Katherine full of nerves and excitement. It was filled with nothing but joy and was beautiful in every way. After the ceremony Katherine and Will had good luck on their day with rain but it didn’t stop the party. We headed back to the venue to photograph them with the gorgeous car before swiftly lining up for their announcement. After their announcement the rest is history. A great time was had by all and we are so happy to have been apart of their special day documenting their story. We wish Katherine and Will loads of future happiness and continued love and support for each other. Here’s a peak inside their day….